In November 2016, a group of long time Cockfield residents published a collection of their memories of life in Cockfield from the end of the First World War until 1960 which attracted much interest. 500 copies were printed and except for a very few have been sold. Now it has been suggested that a further collection of memories from 1960-2000 could prove equally interesting in describing changes the village experienced during that period. The closing of the railway line under Dr Beeching. The opening of our own “M2” bypassing Windsor Green. The establishment of Cockfield Community Council as a vehicle for fund raising activities in the village. Firstly to raise finance for a new village hall, a village car park and, later, an extension to the hall and for other village facilities such as the cricket pavilion, playground furniture, village minibus etc. A flourishing community spirit with the village working together to organise such ambitious fund raising events as ‘Farming through the Ages’, Church Flower Festivals and celebratory events such as ‘Cockfield 900’. The building of new housing, in particular at Dukes Meadow and Cross Green, bringing new energy to the village. Changes at the Village School as a result of moving from a 2 tier to a 3 tier system. The start-up of a pre-school, later Catey. Enormous changes in farming practice. 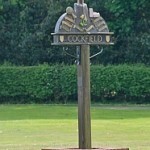 Cockfield’s success in ‘Best Kept Village’ and later ‘Village of the Year’ competitions. The birth and development of the Earls Meadow project. If there is enough interest in publishing a follow up edition, there is a ring-fenced sum held by Cockfield Community Council for financing the printing. So if anyone living in Cockfield at that time would be prepared to write about their memories, or if you know of anyone who was living here but has since moved away who might be happy to help, please let us know by email to enquiries@cockfield.org.uk. A small, informal group can then be set up to produce, for posterity, an invaluable profile of Cockfield during the second half of the 20th century.